"Bespoke", it's not just a pun, it means "custom-built" or "built-to-order" as that is the difference between hand-built wheels and wheels that emerge from a factory production line. That's not to say that factory-built wheels are bad, just that they are the result of compromises made necessary by mechanised assembly and economies of scale. A bespoke wheel is not restricted by these production issues and can be tailored more precisely to a rider's cycling style and weight. Without the pressure of churning out so many "units" per hour, the wheel builder is free to give each wheel the time it needs to reach a finer degree of trueness, strength and resilience. With factory wheels you purchase a "model" and that's pretty much the only choice you can make. With a bespoke wheel there's a huge choice of hubs, rims and spokes. Worldwide there's probably over 80 hub manufacturers, at least 40 rim manufacturers and perhaps a dozen brands of spokes. Take each manufacturer and multiply by the number of models in their range and you will see that the possible number of component combinations is enormous. That's not to say that every possible permutation of components leads to a good or even to an appropriate wheel. So if you are not sure what to look for just ask. Advice is free and given willingly. Ianardo da Lynchi is my alter ego. Long long ago when time seemed infinite, I bust a rear wheel. Being new to cycling I asked my LBS what to do and was advised to have the rim replaced. Asked if I wanted the same model rim I stupidly thought I'd try a different one as I'd seen that DT Swiss made some nice looking stuff. That of course led to me needing new spokes as well. The rebuilt wheel was fine and carried me for a thousand miles or so when the hub started to play up. It was then that it dawned on me that a new hub would mean another rebuild fee and maybe new spokes all over again. So started my fascination with wheel building. With an engineering background it was the theory that interested me at first, and in particular how to calculate spoke lengths. This led me to writing my own database so that I could not only calculate spoke lengths but also record the particulars of each wheel build. 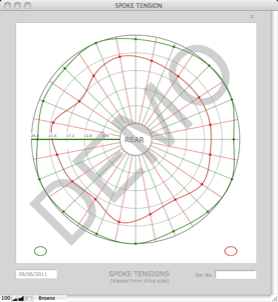 I subsequently made this database, "WheelBuilder Personal Edition" available for wheel building enthusiasts as a free download. For my own business I greatly expanded WheelBuilder PE to link with a parts list and to produce the kind of paperwork such as invoices, quotations, job tickets etc that a small business needs. I'm particularly pleased that with WheelBuilder Pro I can now supply documentary evidence of all the measurable parameters of each wheel that I produce. Much as I enjoyed making wheels, there came a time when I simply could not justify building anymore wheels for my own use. I only have one pair of legs and can only ride one bike at a time so if I wanted to continue I'd have to start building wheels for other people. To do a wheel justice takes over an hour but alas it's not possible to charge the sorts of hourly rates normal for my IT consultancy (which itself is nothing like that charged by plumbers but that's another story altogether!). But although it's not great business it's still immensely rewarding. Although there's an element of "art" about building wheels, I have come to understand that it's mostly a skill that can be learned by anyone with enough interest and a sense of pride in their work. There are procedures to follow that will result in wheels that are not only true but will also remain true for many thousands of miles. And that is all I aim to achieve. How I go about it I've written up in the Quality Standards section for anyone whose interested. Few words can be written without first acknowledging this short work as the "go to" reference text on the theory of the bicycle wheel. Gerd must by now have some 50 years of wheel building behind him. An industry legend. The English is a little quaint but his method is foolproof. Accompanying DVD is "Maîtriser la Roue" (Mastering the Wheel) www.uci.ch. 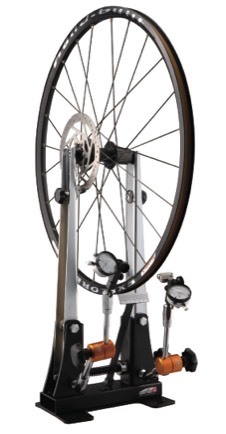 Quite simply the best £9 you can spend on wheel building! It's not possible to mention anything about cycling without a respectful nod to the late and venerated Sheldon Brown. If you have a question about anything to do with bikes, it's very likely that Sheldon has already thought about it.